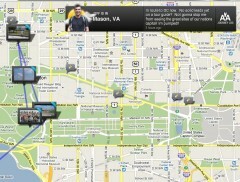 Reality Star Needs a DC Tour Guide! Right now, CBS is filming Around the World for Free here in DC. The show is an online/broadcast reality series based on whether a person can circle the globe without any money, relying on the kindness of strangers. Currently, Jeff Schroeder of Big Brother and Amazing Race reality fame, is in DC looking for a tour guide and for direction on where to go next. (At last check, he was near the Monument, taking a photo with a visiting Boy Scout troop.) If you want to help him out either in showing him around the city or furthering his quest to circle the globe, get over to the CBS website and volunteer your services or log in to leave some encouragement. Then let us know what happened!